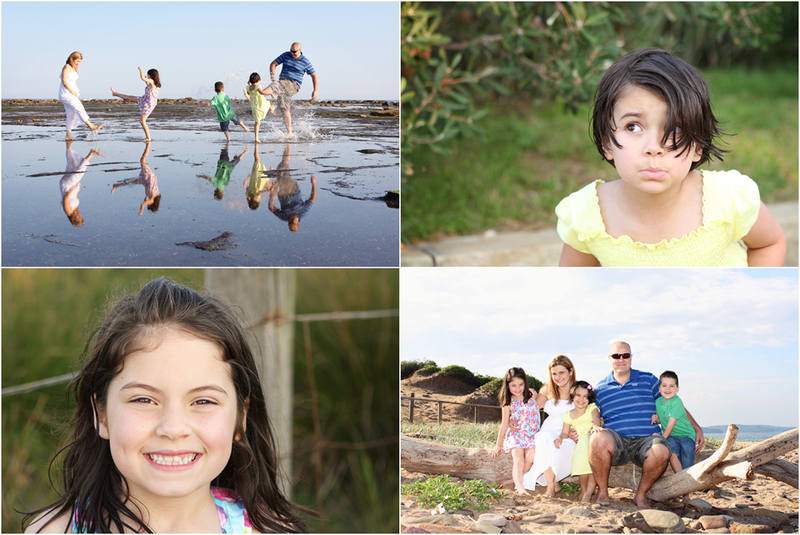 This fabulous family decided that they wanted to have photos at the beach, so one late afternoon we made our way down to Long Reef to see what we could find there. I had already checked that it would be low tide, so most of the sand and rock platforms would be exposed, giving us loads of opportunities for exploring and some interesting shots. It was the end of a beautiful sunny day, a little bit windy and made for some fantastic photos! 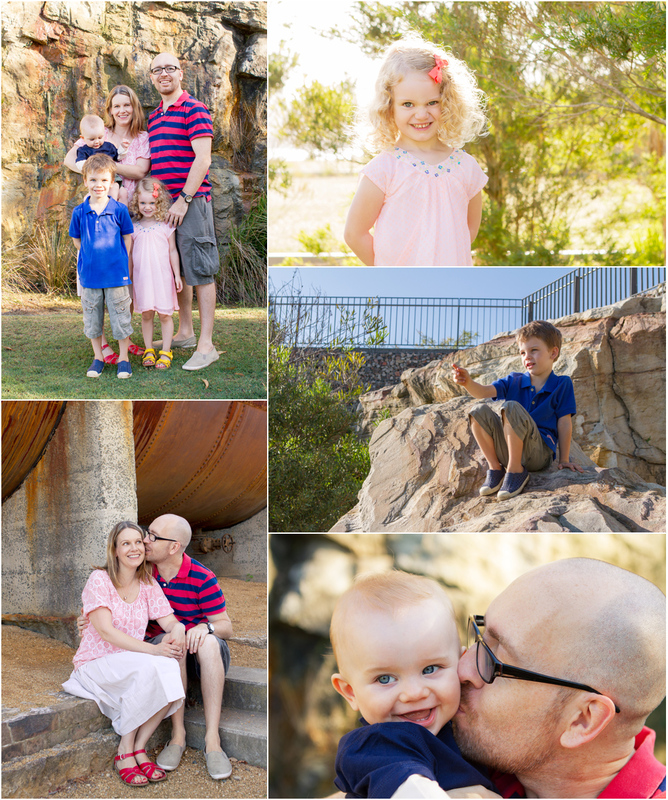 It was a gorgeous sunny morning in Sydney when I met up with this family to take their photos at Ballast Point Park in Balmain. The kids were fantastic, happy to have their photo taken and keen to show me to all their favourite places around the park – it is pretty local to them so they know it well. There were three, no four, no FIVE favourite places we had to go to and take photos in each – all of them just perfect! And baby Gus is one of the most smiley bubs I’ve met and would look over with a big grin almost every time I called out to him. 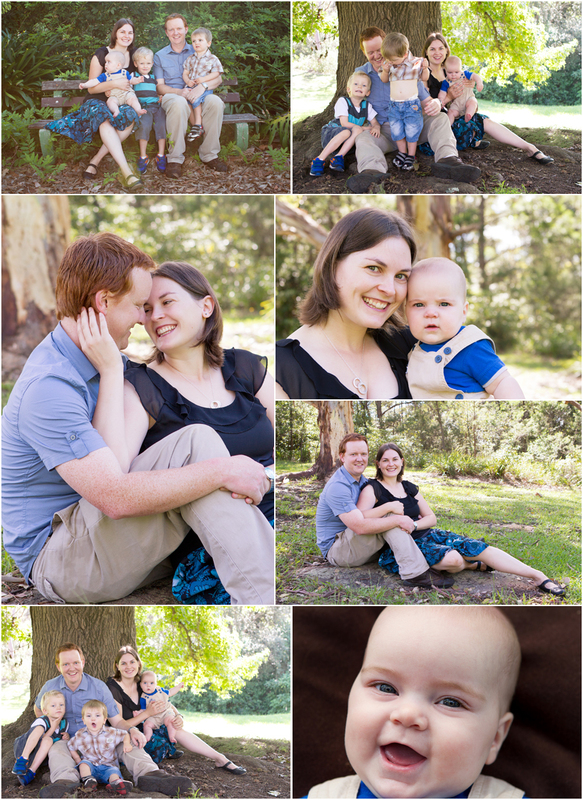 It was a gorgeous misty morning up in the Blue Mountains of Sydney when I headed up to photograph this gorgeous family. I hoped the mist would hang around for a while and give us some lovely soft light, but it cleared quickly into the most glorious day for the start of autumn. The older two boys were a little unsure about the whole thing at first, but quickly got into it and we got some lovely photos of the boys and the family. 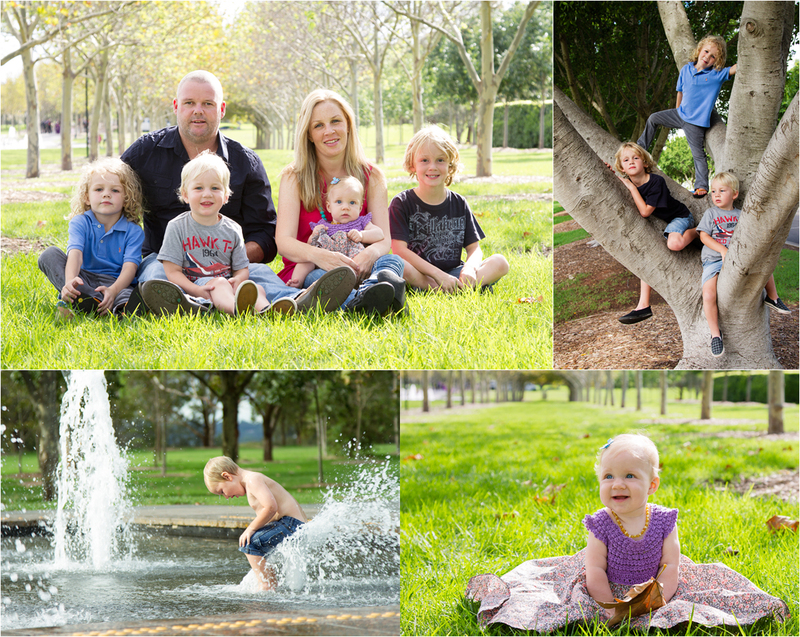 While the grass was soaked from morning mist, there were some beautiful big old trees in the park which were just perfect for setting up some shots of the family sitting together. Towards the end, the boys got a little tired of “standing in the right spot and looking at the camera”, I grabbed some photos of mum and dad together. I absolutely adore these shots, after three kids and nearly nine years of marriage, they are still so obviously in love. Then it was the baby’s turn and he put on a wonderful show of grins and giggles, with a few serious faces thrown in for good measure. He was most obliging, and lay down, sat, munched on his toes AND looked at the camera – a perfect model, and a perfect way to finish off the shoot! Well, this little chap is certainly growing up fast! He was a touch over six months old for these photos and is a deliciously chubby little boy who looks older than he is, possibly due to the loads of gorgeous hair he already has. For this shoot we started at a local park near where the family live. It had been raining all week though, so the ground was soggy and options became limited, so we grabbed a few shots and moved on. We went back to their home to get the main lot of photos done inside and wow what a perfect set up they had in the living area. There were beautiful polished floor boards, against recently painted skirting boards and walls, with huge windows letting in loads of natural light from both sides. Master Lachie is still perfecting the art of sitting up, not that you would know if from the photo below! I love the series of images with Dad reading to him – he looks so thoughtful, as though he’s really taking it all in. And when they pulled out the jack-in-the-box, he became so focused. He’s such a cute little boy and with such a sunny disposition, it was an absolute pleasure to photograph him with his mum and dad and catch up on how he was going. This family was always going to introduce a little bit of chaos to things with 3 boys under 7 and a 6 month old girl in the mix. The mum described it to me as herding cats when the three boys are all together and she wasn’t far wrong! I had met them all previously as the little girl is born on the same day as my daughter, but never all of them at the same time. Having said that, the boys are fantastic – friendly, energetic, cheeky – and all with gorgeous blond hair. While the boys complained a couple of times about having photos taken, they still managed to find bridges to run across, trees to climb and water to play in. These boys don’t do anything by halves and were all soaked by the end. I seem to be getting into the habit of finding some water to be splashed around in at the end of a shoot! Well, not my backyard personally… This beautiful family were catching up with friends later in the day who just happened to live on this lovely property with a gorgeously landscaped yard. 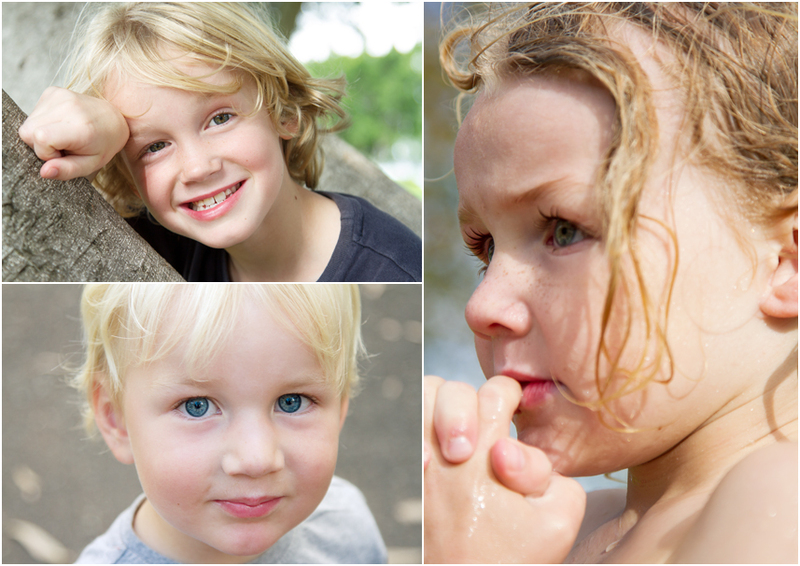 I love doing shoots like this – we wandered around, letting the kids do their own thing, getting them back in for some whole family shots, then letting them go again and capturing the natural groupings as they occurred. Finding great little locations in the yard, getting the family in the general area and seeing what happens, give a few directions, but basically letting them interact in their own way and coming away with some beautiful photos. The kids were fantastic! The boys were so well behaved and into the whole thing while the little girl toddled around after her big brothers and her parents. This is a family that obviously love each other to bits. That photo below of the two boys – I just asked them to sit next to each other on the steps and this is what they did, such a special photo. It was a pleasure meeting this family and taking their photos. With these first few blog posts I will be mixing in a few of my favourite previous shoots along with posts for new shoots. I’ll also try and give you a bit of a “look” at what you can expect while on a shoot with me. 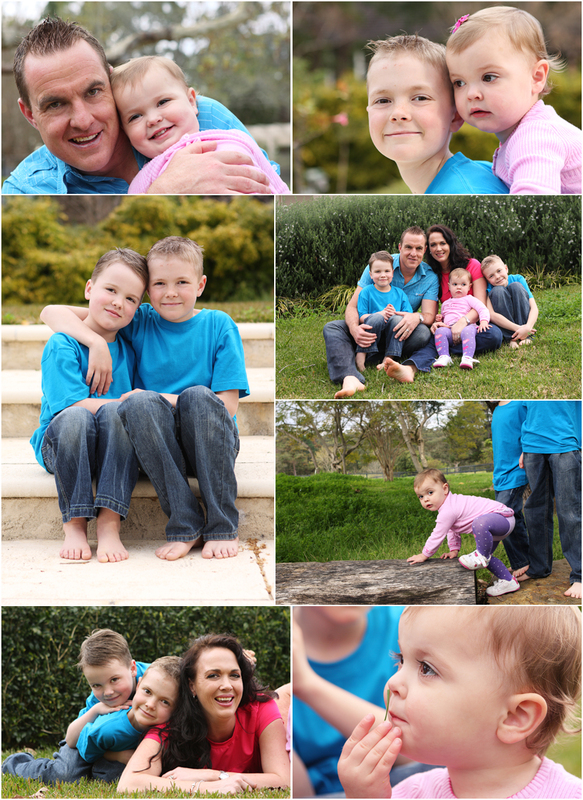 I absolutely LOVED doing the photos for this family! 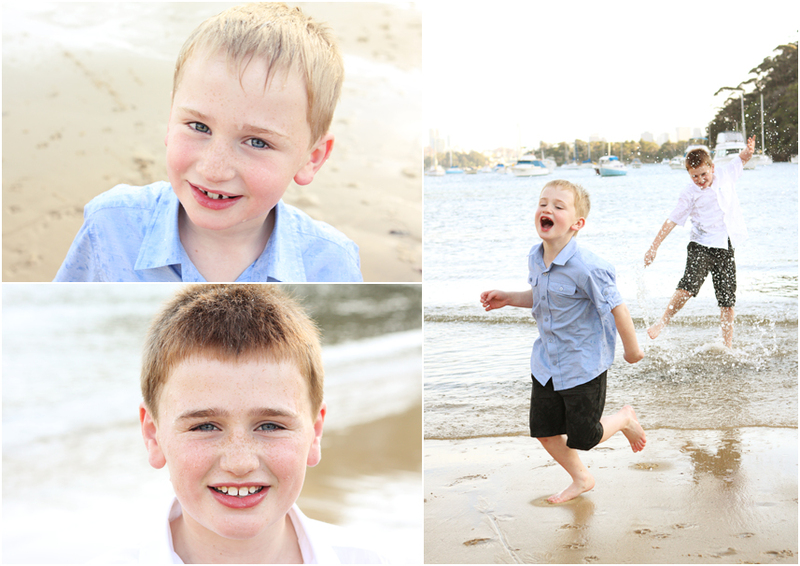 The mum is an old school friend and their two boys are so energetic and full of life. 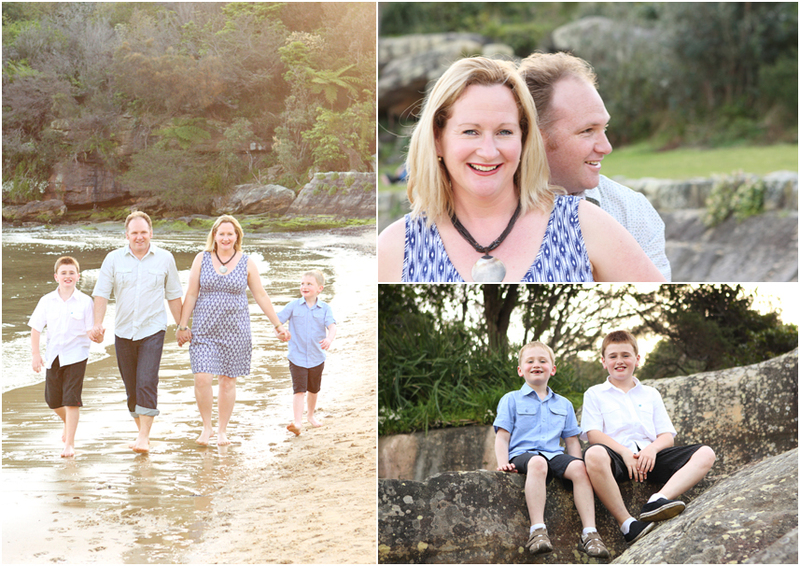 We met down at Sirius Cove on a beautiful spring afternoon and started off with some simple family portraits away from the water before moving down to the beach. 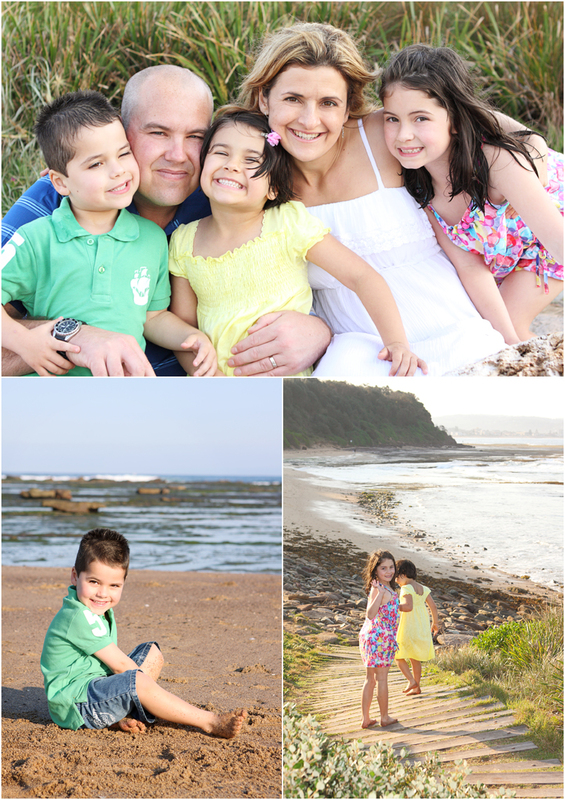 This is such a great location and for a small park has such a variety of settings – grassy areas, stone walls, rocky outcrops, bush and of course, the beach itself. The further through the shoot we got, the closer we got to the water until everyone (except for me!) was IN the water to some degree. The boys still had energy to spare, even after jumping off the stone wall onto the beach for again and again and again, so I suggested some action shots in the shallow water. The below photos show them finally starting to get a bit tired (and just a bit damp) after splashing around. The best part about the whole thing? Not too long afterwards, I caught up with the family at their home to be proudly shown several of their photos from this session printed on canvas and hung up around the house. 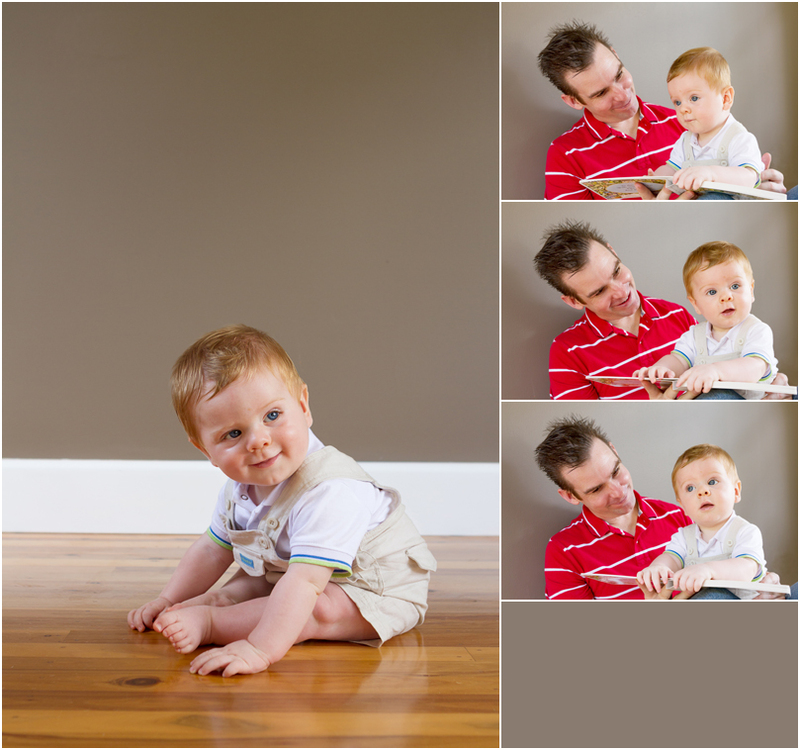 The two boys had a collage canvas made up with three of the images each to hang in their own room as well – love it!